Colin and I enjoyed another Christmas in the southern hemisphere. We had a mind-blowing road trip around Namibia where we saw animals. All the animals. So many animals!! 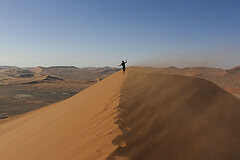 Also the world’s tallest sand dunes, blasted moon-like valleys, spectacular cliffs and salt flats that stretched forever. Next we spent a month in beautiful Bali, Indonesia, where I worked on Rebuild to the sound of monks chanting at our local temple. I’m an atheist and not into yoga or meditation or spirituality in general, but Bali has this culture of melding art and religion with everyday life in a way that makes it all seem more meaningful. Every day someone has to prepare little offerings to decorate the family shrine, the doorway to their business, the dashboard in their car. The bustle of modern south-east-Asian life (think gridlocked roads and honking scooters) is woven in with daily pilgrimages to local temples to leave offerings and receive blessings. The Bali religion is a mix of Hinduism, monotheism, ancestor worship, animism and superstition. You name it, they probably worship it in Bali. It was oddly like being in a video game world where magic was real and permeated everything around us. Alright, well, none of that’s going into Rebuild 3. Most of the religion in Rebuild is predictable old Christianity, though I imply that the churches are all multi-faith. Religion spreads from devout survivors to their friends if you post them to missions together. Those devout survivors have more conservative cultural views and might disagree with policy choices like encouraging women to be soldiers. This is a stereotype, I know, but it’s something I feel we should be thinking about and discussing more. Is religion a positive force that brings communities together and gives meaning to the chaos of the universe, or does it hold us back by reinforcing oppressive cultural norms and magical thinking? Can it do one without the other? I often wish I was more challenging with this kind of “political” content in Rebuild, despite the possibility of angry fans. As is, you might not even notice my political leanings unless you read every scrap of text in the game. Rebuild 3 is me (Sarah) trying to be respectful, and reflecting the world as I see it. In version 0.90 (currently in the Steam testing branch), I added the first half of Rebuild 3’s story mode and the campaign map. 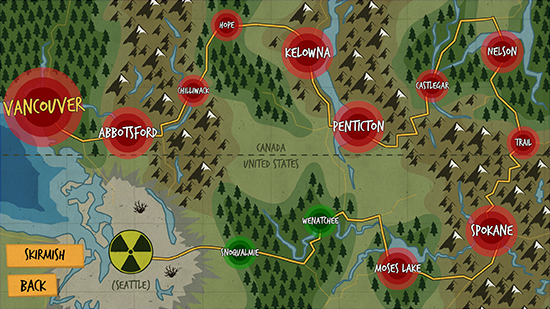 The story takes place in the Pacific Northwest of the US and Canada. You start off fleeing the destruction of Seattle, then head north in search of a cure. Every city has some unique element, plotline or alternate ending to discover. The second half (Canada) will be the final piece of content that makes Rebuild 3 complete. It’s almost done! I haven’t picked a release date yet but it’s getting very close, so stay tuned… the Android and iOS versions should follow a few months later in the summer. I still have… ugh… 400 items on my TODO list, but I can see the light at the end of the tunnel now. I even found time to write this post. Thanks as always to the wonderful beta testers who’ve been so diligent at finding bugs and sending me feedback with each new release. Thanks to everyone waiting for the mobile version for your patience and support. Not long now! The game looks good, and from what I’ve seen, is like last stand in the traveling across the country, getting tools and recruiting people to help in your journey. Good game, and is a new sort of type of zombie game that I havent seen before. Good job!